RIVERSIDE units along the Burnett River are a step closer after operational works were lodged with Bundaberg Regional Council. The lodgement of an application for operational works approval represents another step forward in the development of a significant riverside unit project. Last year the council considered a material change of use application and granted a development permit for the construction of twelve residential units overlooking the Burnett River. The unit application sought a material change of use over a vacant 1916 square metre parcel of land located at the northern end of Targo Street fronting the Burnett River. Planning and Development spokesman Ross Sommerfeld said lodging an application for operational works was an excellent indication that the developer was intent on progressing the project. The operational works approval is being sought by the developer Quay on Quay Pty Ltd.
Cr Sommerfeld said the project had the potential to be the springboard to spur development along the banks of the Burnett River. "In recent years there has been very little by way of development along the Burnett River which is a truly beautiful and vastly underutilised natural asset of the Bundaberg Region," he said. 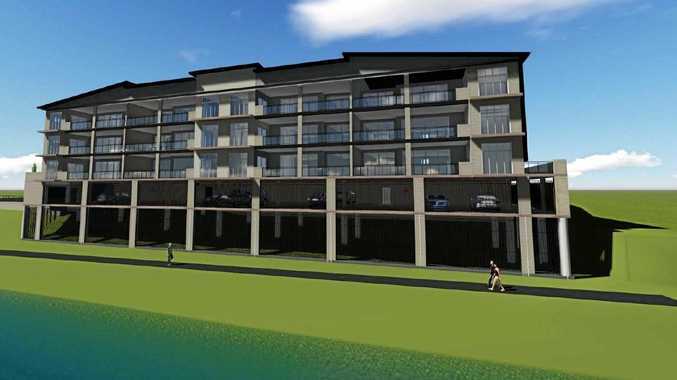 "This proposed building, which will consist of three storeys, will sit adjacent to the RSL and nearby Burnett Riverside Motel and will have easy access to the riverside and the CBD providing an enjoyable lifestyle for any future residents." Cr Sommerfeld said the development approval had been conditioned with 63 conditions and numerous advice notes appended. "Due to the location of the proposed building, the applicant has been required to provide engineering analysis and designs to meet strict planning conditions which apply to structures within this location," he said. "This is an exciting concept with the development offering extensive east/west vistas of the Burnett River. "It is a concept that dovetails with Council's Riverside Master Plan proposals. This may well light the fuse on similar projects that have been discussed but not yet acted upon."